It has taken me a long time to get into this headspace but now I am here, I really see the value in finding something that helps you take away the stress of your day. I work in a normal day 9-5 & just like everyone else, it has its ups and downs. I've found going to the gym after work is an amazing way to leave my work day at work (or at Boxercise or the rowing machine!) and not carry anything home with me. My motivation for going to the gym is about being healthier so that one day if I do find myself blessed with a baby that I will be a fit mum & have an easier pregnancy. I have tried so many gyms from little independents to well known chains. I've settled with DW Fitness for now as they have a lovely feel about them. They have a mix of older people and younger people. I've chatted to big muscle guys and grandads who are trying to stay mobile! I think finding an environment that is best for you often takes some shopping about. Don't be embarrassed about shopping about. A gym membership can be expensive and a year long commitment. Plus, remember, there's drop in classes in most leisure centres that are pay as you go if this is easier for you. I've found people to mostly be lovely at the gym. Everyone is either there to look or feel better so there is a nice pack mentality in a way! This has been one of my most asked things on Instagram! I love gym wear! I mostly wear Victoria's Secret PINK gym wear as it washes SO well plus the legging are so high waisted and hold me in! 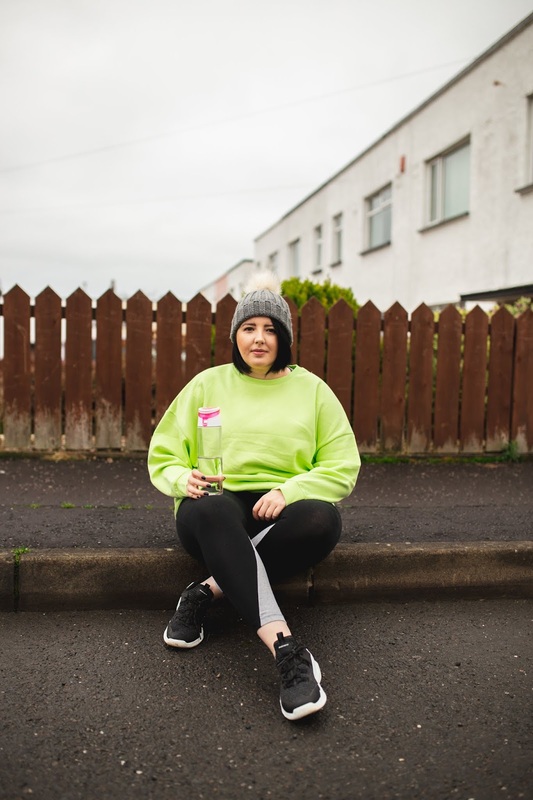 I'm also a fan of Matalan and Primark (like the neon jumper I'm wearing in this post!) for affordable options. I've also recently discovered the absolute joy of Decathalon - it's like IKEA for gym gear! I also have picked up some well priced gems from TK Maxx over the years. I mostly wear M&S Sports Bras but in a Insta-Poll, the Shock Absorber bra came out on top so it's next on my hit list to try! Telling my best friend & work mates that I was trying to get healthy has really motivated me. They've checked in on my progress, encouraged me but also reminded me not to be hard on myself if I'm having a bad or busy day. My goal at the minute is to go to the gym 3 days a week as that seems to be the amount I need to keep me mentally good (a self prescribed medication of 3 x 1 hour work outs!). If you are like me and have a real desire to get healthy, take the bull by the horns. I honestly feel great for starting a new habit that I know is going to make a difference in the long run.